Cloak and swagger: A trip to the mosque. I’m far from the sixth pillar of Islam; sadly more Haram than Halal. There’s not even a single spiritual fibre of my being… I get the giggles during yoga sessions and vegetarian sausages make me sad. But there’s something undeniably magical about The Grand Mosque at Abu Dhabi. And no, it’s not just because the spiraling arches and swooshing black cloaks (which they enforce upon the ladies!) make you feel like you’re at Hogwarts. Wearing an abaya was exciting. Though I couldn’t wear one every day; I boiled. It was 100 degrees and I have never been so sweaty in all my days… There was liquid pouring from my eyeballs and my nostrils… And all the places I had no idea could perspire. The abaya is meant to be an equaliser; a garment which hides any idiosyncrasies, all curves, basically anything that could dare set you apart from the next individual – to encourage the Islamic ideals of modesty and humility – but I have one of those bodies that likes to BREAK-OUT of all constraints placed upon it. This physique wasn’t meant for morality.The abaya kept creeping up, so I was flirting my ankles to all and sundry, like the whore of Babylon herself – twice they popped out and security asked me to put my ungodly malleoli away… I’ll understand if my flagrant immodesty makes you wish to never speak to me again. To cast myself further into the fires of hell? Glimmers of cleavage kept bursting through the neckline … so I had to stop every 10 footsteps to adjust my garment and cease all those around from praying for the salvation of my harlot soul. Wearing an abaya is not easy; I have a new-found respect for those who adorn it daily and sashay it with such grace: while I tripped over it three times, and kept getting it caught in doors and escalators. It was even difficult to keep the hood up: My thick, disobedient hair kept finding a way out, added humidity had given it an incensed streak far more defiant than usual. Yeah – if I’d been born in the gulf I’d probably have been sent to reform school as an infant. Or just drowned at birth. But enough of my inabilities to be a devout human – The Mosque is beautiful: the sort of colour you’d expect unicorns to be; whiter than an EDL rally, but a thousand times more graceful. It practically blinds you. Large enough to accommodate over 7,000 worshipers at once, and with minarets which spire over 350 feet in height – the mosque was commissioned by the late Sheikh Zayed who it is now named for, and whose body lies in a crypt underneath… What a decadent way to go. It’s easy to lose hours, if not days, just wandering around and enjoying the prettiness of it all. The arcade pools were my favourite… though it was so oppressively boiling by this point, I was ready to rub my face in them, and once again procure the disdain of security. Most importantly? 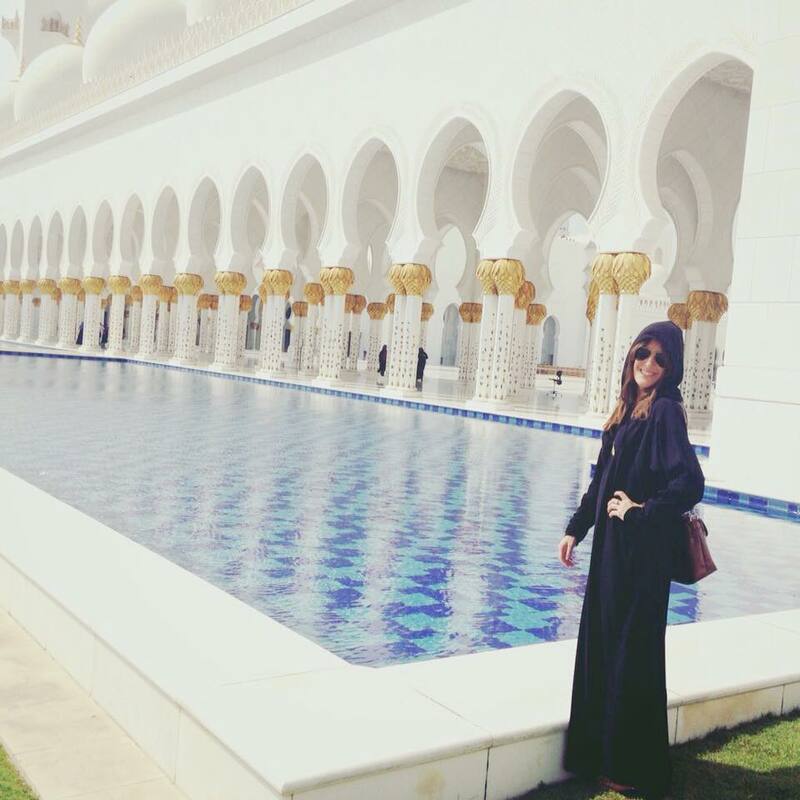 A trip to The Sheikh Zayed Mosque is absolutely FREE – so theoretically? You could meander through the 24-carat-columns FOREVER … apart from the fact it’s deemed uncivil to eat or drink there – so 2 hours was the maximum I could manage before throwing a hangry tantrum and starving to death on the floor. Fasting makes me murderous and I have no self-control… which culminates this post in two more reasons for why I’d make a terrible Muslim. Or Christian. Or just about anything that involves having any moderation or restraint. Next Every day’s an adventure. Sounds like an amazing place, great photos! I can’t believe I still haven’t visited it! Been in Abu Dhabi but just never went..It looks so peaceful, like a fairytale.